VCA-Module with exponential and linear control inputs. This way it can be controlled by any CVs and it is suitable to control audio signals as well as CVs. With the "initial level" control you can open the VCA manually what is handy if the modulation signal is bipolar: e.g. when doing a tremolo with a sine wave LFO. 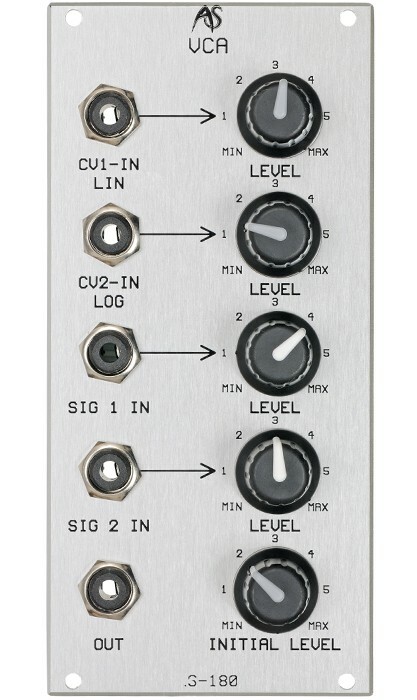 Tow CV inputs with attenuators are available: The linear one is better when you want to control CV signals or if the modulation signal is a slow LFO. The exponential input is better for punchy, fast modulation, e.g. by an envelope and is also better suited when you want to control audio signals. Two signal inputs make a mixer module pre-VCA obsolete.